Saudi Build, a leading international construction technology and building materials trade exhibition held in Riyadh, Saudi Arabia, concluded on a successful note, witnessing a strong footfall of more than 16,000 trade and professional visitors. The 27th edition of the construction event, held from October 26 to 29, was attended by several dignitaries at the Riyadh International Exhibition Centre. 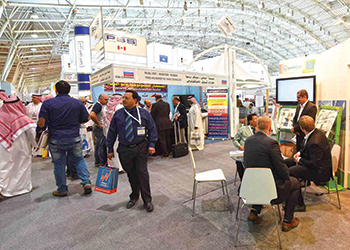 It hosted over 850 companies from 38 countries in more than 25,000 sq m of exhibition space, featuring 15,000 sq m of indoor air-conditioned halls, 4,000 sq m of temporary built structure, and 5,000 sq m of open-air exhibition area, according to the organiser Riyadh Exhibitions Company (REC). Saudi Build 2015 impressed visitors through its unique display of the latest building technology solutions, some of which are new to the region, said the organiser, adding, many innovative products were also launched. The four-day event offered a tailor-made platform to exhibit solutions for the entire construction industry including building materials and equipment; architectural finishing products; stone, marble and granite products; construction tools and technology; engineering services; infrastructure materials; and security and safety systems.